This is super sweet. I really like it. Happy Saturday Dawn!!! 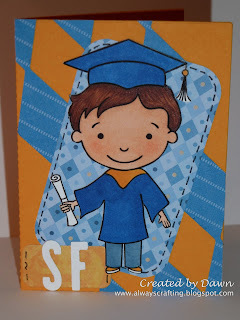 What a cute grad card....The army hat is over the top :o) TFS!!! How adorable! Love the colors of orange & blue. Love the folder die, may need to look into that one. Great idea to use as a gift card holder. Super CUTE! Love your adorable design! This will be a huge hit! Thanks for joining us this week at Delightful Challenges! Adorable! LOVE the army hat!! This is a gorgeous grad card! Thanks for joining us at DCD!! Very cute card, thanks so much for joining CCC! Great graduation card. I love what you did with the inside. Thanks for playing along with us at Tuesday Throwdown. Thank you for joining us at Catch the Bug with Bugaboo Stamps this week ! I love your card ! Great choice of colours ! Good luck !